Pin up this vast ensemble of extremely colorful and engaging charts in your classroom or at home to assist little ones in identifying number words. 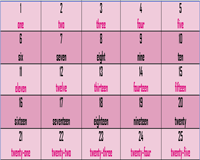 The 1 to 5, 1 to 10, and 1 to 20 number word charts include colorful themes and basic charts that can be downloaded in color and in black-and-white. 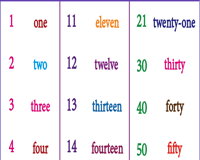 Number word charts from 1 to 50 , 1 to 100 and multiples of 10s up to 100 are also available in color and monochrome. The charts displayed here are aligned with common core state standards for Kindergarten and 1st grade. Encourage young ones to observe, count and read numbers and number words up to 5 with this vibrant collection of charts that includes bird and reptile themes. Pin up our basic color charts that make for great visual aids! This array of black-and-white charts includes both theme-based and basic charts that display numbers and number names from 1 to 5. Suitable for Preschool and Kindergarten children. Enhance children's counting skills with this series of colorful and engaging charts that exhibits numbers and number words from 1 to 10. Clip these theme-based and basic charts onto the bulletin board to provide little ones a great learning experience! Make learning fun with this set of black-and-white charts that comprise numbers and number names from 1 to 10! Get kids to color images of insects and stationery items as they identify numbers and number words. Download our basic charts too! 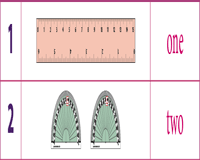 Display this selection of attractive charts at school or at home to help children learn number words from 1 to 20. The theme-based charts include colorful vegetables and endearing animals! 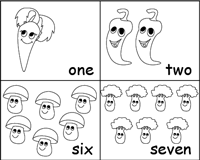 Our basic charts provide a quick snapshot of number words up to 20! Reinforce your kid's skills in identification of number names up to 20 with this series of charts! Employ the theme-based charts to improve children's fine motor skills by getting them to color the images. The basic charts provide for a handy guide to recall number names. 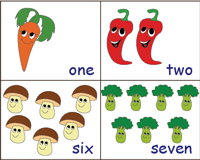 Pin up these number word charts to assist kids in recognizing numbers and number names up to 50. 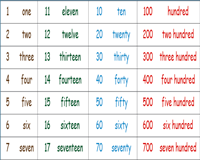 Use this color/black-and-white chart and devise your own method to help children in learning number words from 1 to 50. 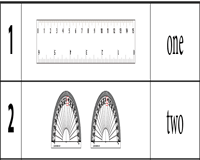 This set of resources forms a great visual aid for representation of numbers and its number names up to 100. Download our color/black-and-white printable charts to boost the skills of young ones in recognizing number words from 1 to 100. 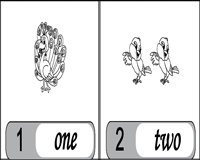 Help your kids gain a better grasp of number words in multiples of tens with this set of color and black and white charts. This makes for an excellent teaching aid, especially if you display the charts and ask children to repeat after you. 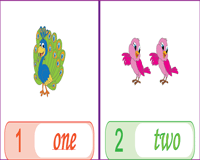 Use our dazzling display of resources of printable charts to bolster your child's ability to recite number words up to 21 and then follow it up with multiples of 10s up to 100. Both color and black-and-white charts are up for grabs! Keep children engaged by downloading these amazing charts that have 4 columns. 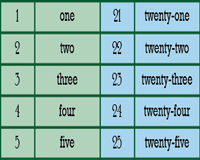 Two columns contain number words up to 20. 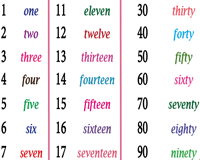 The third column comprises numbers in multiples of 10 up to 100. 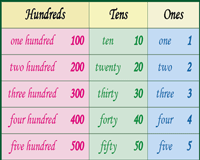 The final column displays number words in multiples of 100s up to thousand. 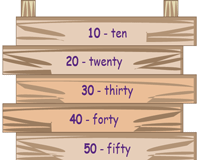 Enable young ones to review their knowledge of number names from 1 to 20 followed by multiples of 10s up to 100. Also included are the number words of a thousand and a million. Improve your child's ability to recognize bigger number words with these color and monochromatic charts. Introduce little ones to the concept of place value with this set of printable number names charts that comprise numbers in one's, tens and hundreds. This forms a great resource for number recognition based on place value.